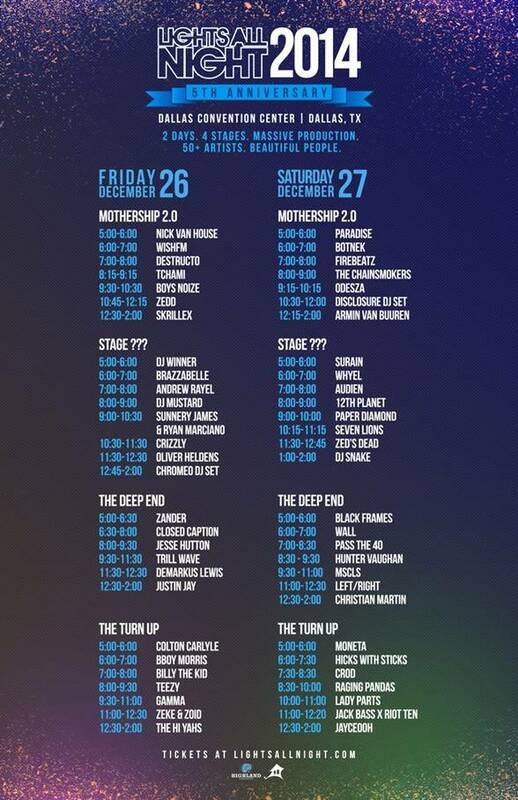 Just one day after Christmas, Santa gives Texas EDM fans what they really want when the two-day LIGHTS ALL NIGHT extravaganza takes over the Dallas Convention Center on Friday, December 26 and Saturday, December 27. Featuring headliners such as SKRILLEX, ZEDD, ARMIN VAN BUUREN, DISCLOSURE (DJ set) and more, it’s bound to illuminate the Lone Star State like never before. The set times for LIGHTS ALL NIGHT, Texas’ largest electronic music festival produced by Highland Concerts and MCP Presents, have officially been unveiled. Check them out below and at the event’s site www.LIGHTSALLNIGHT.com. LIGHTS ALL NIGHT will feature over 40 top-tier electronic artists over two stages with cutting-edge LED and lighting designs encompassing much of each room, dramatically adding to the overall music experience, as well as two silent discos, enhanced VIP and bar areas, elevated and reserved table service with prime sightlines to stages. In addition, premier electronic cigarette manufacturer, blu eCigs, an official sponsor of LIGHTS ALL NIGHT, will present the blu lounge where adult smokers can get a complimentary sample of blu electronic cigarettes, relax in the lounge area and take a commemorative photo at their photo booth. blueCigs will be providing consumers the opportunity to smoke at the festival where other forms of smoking or vaporizing are not allowed in the venue. Additional sponsors for LIGHTS ALL NIGHT include Bud Light, Dallas Community College District, Red Bull, Purple – Dallas Purple Party and UBER. Download the UBER app to your smartphone and enter promo code “LAN15” to receive your first ride for free, up to $20 off. This entry was posted in LIGHTS ALL NIGHT, Press Releases. Bookmark the permalink.